Cheap flights to Georgia: Tbilisi from Prague for €150! We have posted many cool deals from Poland to Kutaisi in Georgia but right now you can book also cheap flights to Georgian capital from the Czech Republic. 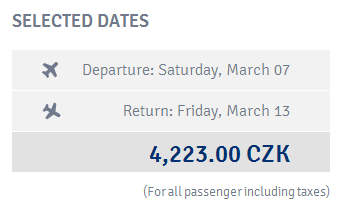 Return tickets from Prague to Tbilisi will cost you only €150 / 4223 CZK. The flights is operated by LOT with 1 short stopover in Warsaw. Check-in luggage is included in the price. Regular price on this route is usually around €300 so you get 50% off! Travel dates are from February to April. Book your tickets directly through LOT for the best price. Georgia is pretty cheap country and Tbilisi offers plenty of accommodation options online. You may find even better deals if you ask around directly when you arrive to the town. Check our search engine anyway to see if there are some good deals available. « Cheap flights to Sardinia: Alghero from Bratislava for €46!